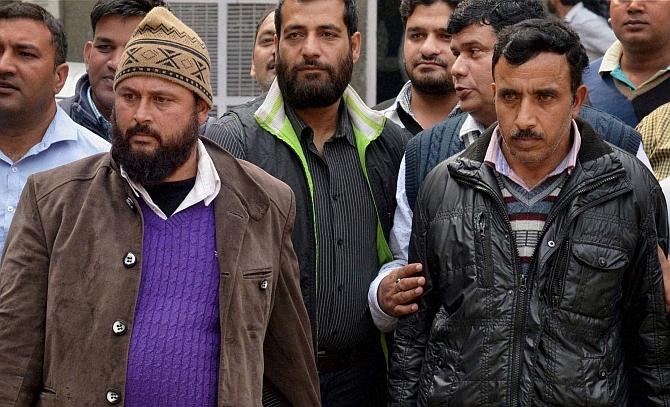 Interrogation of the last three accused arrested in the suspected ISI-linked espionage racket by Delhi Police brought to fore a conflict within the spying ring which might have led to its busting. Former army hawaldar Munawwar Ahmad Mir, government school teacher Sabar, and serving army rifleman Farid Khan were presented before a Delhi court on Monday, following which they were taken on police remand till December 10, said a senior police official. When they confronted during their interrogation, it came to light that Farid came in touch with Mir and Sabar in 2013 when he was posted at Poonch district of Jammu and Kashmir, said an official privy to the investigation. They introduced Farid to Kafaitullah Khan, the alleged intelligence operative who headed the ISI-backed espionage racket, and Farid allegedly started passing on documents related to troop deployment and threat perceptions, said the official. He transmitted documents mostly through Sabar. The documents were further sent to Faisal, who monitored the espionage racket's activities from Pakistan and also gave them assignments at times, through e-mails, said the official. It was Kafaitullah, who received money transfers, partially through bank and a private agency. He later paid off his spies, including Farid, said the official. It was towards the end of 2014 that Farid, posted at Jammu and Kashmir Light Infantry division of the army, was transferred to Darjeeling. He allegedly continued sending secret documents -- under his code-name 'Surgeon' -- from the army units based in east but most of them were rejected by Pakistan-based operative Faisal, said the official. When a disgruntled Farid communicated this to others in the racket, they told him that the documents he had sent after being posted in Darjeeling was not of any use to the consumers of the data allegedly transmitted by the espionage racket, said the official. The last remuneration which Farid is found to have received was of Rs 50,000 sent through bank transfer by Kafaitullah in four instalments in the first half of 2014, said the official. "Farid was later side tracked by Kafaitullah and he has not been active for at least the past six months. The conflict with Farid could be a reason behind the network getting cracked open," said the official. Around a month ago, an "informer" approached police and reported about the espionage racket, following which a case was registered on November 16 by the Crime Branch. On November 26, they intercepted Kafaitullah while he was on his way to Bhopal in a train, said the official. Apart from secret and confidential documents recovered from Kafaitullah's possession, the police recovered a CD, in which he had recorded several conversations with alleged associates of the racket, said the official. The evidence obtained from Khan's possession later led to the arrests of serving BSF personnel Abdul Rashid, who was allegedly an active spy at the time arrest, Mir and Sabar from Rajouri district in Jammu and Kashmir over previous week. Farid was arrested on Sunday after being handed over to the police by the army, which has already detained him in connection with the case after being reported.